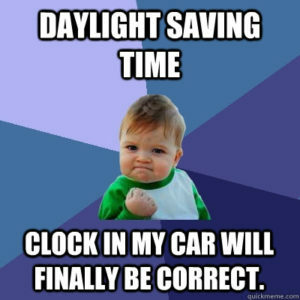 When local daylight time is about to reach Sunday, November 5, 2017, 2:00:00 am clocks are turned backward 1 hour to Sunday, November 5, 2017, 1:00:00 am local standard time instead. 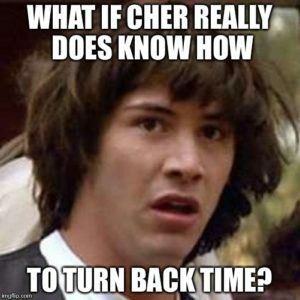 Hence the term “Turn back Time”. Sunrise and sunset will be about 1 hour earlier on Nov 5, 2017 than the day before. There will be more light in the morning. 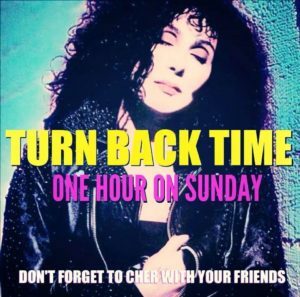 If your country uses Daylight Saving Time (DST), you have to change your clocks twice a year. Do you know which way to turn them in the spring and fall? Here are some phrases to help you remember. This term is meant to trigger your memory to set your clocks forward 1 hour in the spring at the start of DST, and 1 hour back in the fall when DST ends. A different way to remember which direction to set your clock for DST is that in the spring, you bring out (or forward) the garden furniture and in the fall you put it back. In North America, it is common to use the word fall to denote the season, while other English-speaking countries usually call it autumn. “Spring Forward – Fall Back” is therefore a phrase most often heard in the USA and Canada. The expressions “spring ahead” and “spring up” are also used to describe the action of setting clocks 1 hour ahead for the start of DST in the spring. These terms are mainly used in the USA and Canada. “March forward” is a phrase used to remind people about the DST start dates in the Northern Hemisphere, like the USA, Canada, and Europe, where it starts in March. In French, the letters of the month can help you remember which way the clocks are set. In April – Avril – the clocks are advanced: avance. In October – Octobre – the clocks are set back, or reduced: recule. In French-speaking Canada, even though the clock change is in November, the same mnemonic can be used as the month name – Novembre – ends with the same 2 letters. The term “lose an hour here, gain an hour there” also describes the start and end of DST. While being commonly used, it can be a confusing mnemonic. “Losing an hour” can arguably mean both setting the clocks forward (i.e. having an hour less) and back (i.e. “losing” as in “removing” or “decreasing the number”). When looking to buy or sell real estate in Seattle… Work with the Best! David and Jamie De Maria of De Maria Partners.